Sometimes it seems clear that scientists are just using experiments as a way to get close to cute animals. This seems particularly the case of the multiple handedness experiments that have been carried out on primates over the years. Find out which hand gorillas would write with, if they could write. Do you know a left-handed person? Do they constantly point out all the other left-handed people in the world? Mine does, too. Now you can go them one better and tell them that not only are about ten percent of people left-handed, but one hundred percent of gibbons are. Scientists have long done experiments to find out whether left or right handedness predominates in other primates the way it does in humans. Or maybe they just wanted to touch monkeys. In the most controlled experiment, published in 1990, there was some extremely good evidence for handedness. The apes either picked stuff up off the floor, or had to get at it through a mesh. Ten out of twelve gorillas used their right hand as the dominant one, while all six gibbons used their left. Researchers were thrown a curve when orangutans used either hand equally. They theorized that, since orangutans used bipedal locomotion (walking) less frequently than either gorillas or gibbons, it might give them less of a tendency towards handedness. They may have been wrong. A study of nearly 800 total apes gave them the task of grasping a tube with the non-dominant hand while fishing for hard-to-reach peanut butter with the dominant hand. 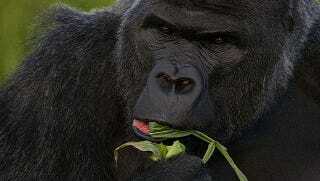 It confirmed the right-handedness of gorillas, and added chimpanzees and bonobos to the list of righties. Orangutans, however, were even more markedly left-handed than gorillas were right-handed. But are they showing us how they use their hands, or are they showing us how we use our hands. Gorillas in the wild are tough to study, but chimps have provided researchers with some interesting findings. A study done of handedness in three different populations of chimps have shown them to be predominantly left-handed for tool use. When they use sticks to fish for termites, they use their left hand. They use their right hand for simpler tasks, like cracking nuts. Overall, though, they use whatever hand that their mothers used. Baby chimps are more likely to follow their mothers' leads - which could mean that adult chimps in captivity, as well as other primates, may be following their keepers' leads. Clearly, the only thing for it is to get more left-handed zookeepers. Via Wiley Online Library, Cosmos, NCBI, PNAS, Pubmed, and University of Texas.